Semmelweis University is the oldest medical school in Hungary. 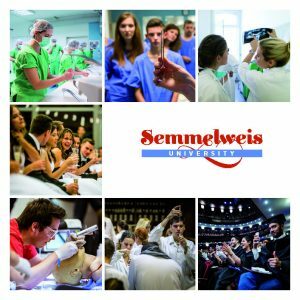 With an over 240-year-old tradition of academic excellence, Semmelweis University is widely recognized as one of the leading centers of medicine, health&sport sciences and education in Europe. A truly international community, the University embraces more than 10000 students from several nations around the world. Semmelweis University has not only earned outstanding reputation within Hungary, but it is highly respected abroad. The Doctoral School of PhD Studies offers more than 40 programmes in Hungarian and English language. Doctoral School’s degree are recognized by the European Union and accepted many other countries around the world. The Semmelweis name and the quality education it represents, draws students from all over the world, creating an exciting, multicultural student community. It is a top priority for Semmelweis University to continually expand its international relations in the academic and scientific fields. The University maintains coopertive ties with over 150 higher education institutions form European countries and other counties. The University is a full-fledged participant in the European Union’s ERASMUS and Leonardo mobility programmes. Many of University’s research groups collaborate with international institutions in conducting and analysing their scientific studies. In addition, the University hosts and co-organises several international scientific conferences and meetings. Semmelweis University is a full member of the most important higher educational organizations, including the International Association of U niversities (IUA), the European University Association (EUA) and the Danube Rectors’ Conference (DRC). Semmelweis University is a research intensive institution, which has been commetted to high-quality scientific research for nearly two-and-a-half centuries. More than 1300 professionals in approximately 120 departments are involved in ongoing research activities. Our Doctoral School serves as an umbrella for a new generation of researchers. Semmelweis University ranks among the leading Hungarian universities regarding to the number os publications in distinguished international journals. There is a rich and varied student life on and off campus with numerous recreational and extracurrcular activities on offer. The Universitiy’s international students are especially active; the International Students Association of Semmelweis provides guidance and support for students new in Hungary and ample opportunities to get involved in the local scene. Budapest, the capital of Hungary is the principal political, cultural, industrial and commercial centre of the East-Central Europe. Budapest is cited as one of the most beautiful cities in Europe. Budapest is one of the richest cities in the world in terms of thermal and spa waters. Among other things Budapest’s main attractions are recreation and night life. Great concerts, opera, jazz, musical, dance are available to enjoy almost every night. There are many events and festivals year by year: Budapest Spring and Autumn Festival, Sziget Festival, Jazz Festival, Buda Castle Wine and Buda Castle Beer Festival etc.